Bishops, and clergy from congregational members of Border Interfaith and El Paso Interreligious Sponsoring Organization (EPISO), are calling for additional protection of the tens of thousands unaccompanied Central American children that are at the Texas border. 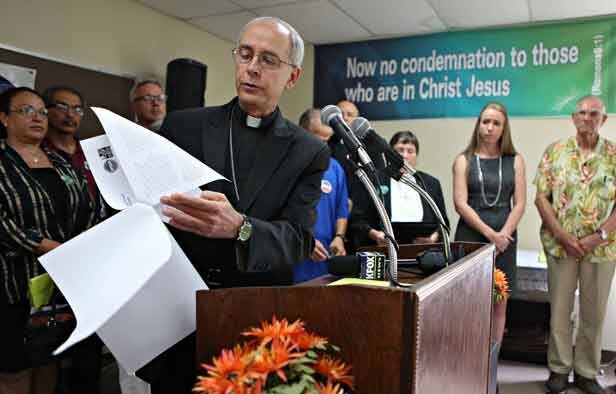 In a press conference in El Paso, Bishop Mark Seitz walked through a letter signed by hundreds of clergy and addressed to the President and to Congress, that details specific recommendations. Clergy leaders want the White House to preserve the protections established in the Wilberforce Trafficking Victims Act of 2008 for those that arrive on our border seeking refuge, provision of legal assistance to any minor under 18 years of age, and attention to the religious needs of the children and family by granting clergy access to US Border Patrol detention facilities and the US Office of Refugee Resettlement.